The most common use of music in professional wrestling is to play while a wrestler, tag team, or stable makes an appearance be it in the ring, on stage, or on the screen. 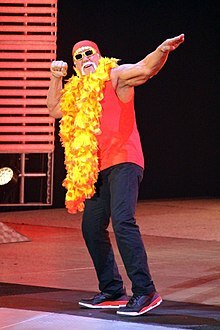 An example seen here with Hulk Hogan making his entrance on a Raw show. Music in professional wrestling serves a variety of purposes. The most common uses of music in professional wrestling is that of the entrance theme, a song or piece of instrumental music which plays as a performer approaches the ring. After a match, the entrance theme of the victor will normally be played as they exit the ring. Entrance themes are used to alert the audience to the immediate arrival of a wrestler, and to increase anticipation. Entrance themes are often tailored to the gimmick of the wrestler they are written or selected for. For example, Jacob and Eli Blu (The Blu Brothers) had an entrance theme in the World Wrestling Federation that resembled a piece of blues music, while The Undertaker has often used entrance themes which resemble a dirge, including the ringing of an eerie bell and a quote of Chopin's Funeral March. In practice, modern day entrance themes are normally rock, rap, or R&B (especially for women), as these genres of music are popular with the professional wrestling key demographics. Some entrance themes are accompanied by the wrestler's recorded voice saying their signature phrase. Examples of this include The Rock's recorded voice saying, "If you smell what the Rock is cookin'!" before his music starts, Booker T saying "Don't hate the player. Hate the game" (WCW) and "Can you dig it, sucka?" (WWE) followed by his entrance theme and Ric Flair's signature exclamation of "Wooooooo!" prior to his entrance theme. Due to licensing costs, entrance themes are often composed by the promotion for which the wrestlers perform in order to avoid having to pay royalties. A promotion might also purchase music from production libraries, which is considered to be cheaper than the royalties of commercial music, or use public domain music, which is available for no fee. Due to less restrictive copyright laws in Mexico, lucha libre promotions use mostly popular songs. In addition, ECW used popular music in order to promote a hip, edgy, counter-culture image. Gorgeous George was one of the few wrestlers in his time to have music accompany his entrances. In the early 1950s, female champion Mildred Burke often entered to theme music, while Gorgeous George was associated with "Pomp and Circumstance", a song which was later used regularly by Randy Savage. Sgt. Slaughter, who has sometimes claimed to have introduced the idea to Vincent J. McMahon, entered to the "Marines' Hymn" at a Madison Square Garden show in the 1970s. Though British wrestler Big Daddy had been using "We Shall Not Be Moved" as his entrance music in the 1970s in the United Kingdom. However, the practice did not become widespread until the 1980s, when the Fabulous Freebirds, Hulk Hogan, the Junkyard Dog, and various World Class Championship Wrestling performers began using rock music for entrance themes. Music is also used as a promotional tool during advertisements, video packages, and as the theme of television programs. ^ "The Greatest Wrestling Stars of the 80's". WWE. 2007-04-15. Retrieved 2007-04-15. ^ "Closed for maintenance - Fighting Spirit Magazine". www.fightingspiritmagazine.co.uk. Retrieved 18 March 2018. ^ Del Mar, Pollo (August 25, 2016). "Rocker Billy Corgan's Impact On TNA Has Only Started, Says Musician Behind Wrestling Theme Songs". Huffington Post. Retrieved September 12, 2017.